Summary: Cameron doesn’t do things by halfs and this intergalactic space battle will set a new benchmark for cinema spectaculars. There is every reason to be excited about going to the cinema in December: Avatar, James Cameron’s first feature film since Titanic 12 years ago, will finally hit screens. A roster of acclaimed classics from the director including The Terminator, Aliens and Terminator 2, together with blockbuster successes such as True Lies and the highest-grossing film of all time, Titanic, mean this labour of love will be the movie event of the year. A 3-D science-fiction epic envisioned using cutting-edge computer generated animation, the hype surrounding Avatar is starting to shift into gear as we creep towards the December release date. Re-teaming with Aliens star Signourney Weaver and revisiting a story of a similar ilk, Cameron first tried to make Avatar after the global box office smash Titanic, but studios baulked at the $400 million budget needed. As a result, the director went off and made undersea documentaries including the Titanic-themed Ghosts of the Abyss which enabled him to work on the 3-D technology needed for Avatar, and bring the costs down to a more studio-friendly $200 million. Twentieth Century Fox have stumped up the cash for the project, and with it they get a slice of sci-fi which could even surpass Cameron’s exceptionally high standards. Despite the protracted development time for Avatar, Cameron has been keen not to show much of what Avatar look like until Comic Con this year where 25 minutes of footage was shown and wowed audiences. Claims of revolutionary 3-D effects which see 40 percent live action blended with 60 percent phot-realistic CGI indicate Cameron has got the looks right, and the plot seems a perfect accompaniment to the lush landscapes and realistic alien creatures he has visualised. Said plot will centre on the distant moon Pandora with a lush rainforest environment filled with incredible lifeforms such as the indigenous Na’vi, a humanoid race that lives at what is considered a primate level. 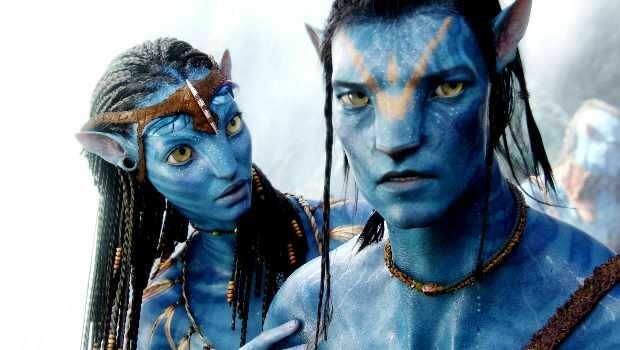 Ten feet tall and blue skinned, the Na’vi live harmoniously within their unspoiled world… until visitors from Earth arrive. Among them is Jake Sully (Worthington), an ex-Marine who was wounded and paralysed from the waist down in combat on Earth. He is given the opportunity to feel whole again by taking control of an Avatar, a Na’vi hybrid body conrolled by a human mind. While the humans have arrived to strip-mine Pandora, Sully finds himself drawn closer to the Na’vi race who, unknown to the humans, have strong warrior abilities. Amid a spectacular battle between the two races, Sully finds himself caught between the military-industrial forces of Earth and the Na’vi. Cameron delayed the release of Avatar seven months from May to December to ensure the effects on Avatar met his high standards and to allow more cinemas worldwide to install the necessary 3-D projectors for the movie. Cameron doesn’t do things by halfs and this intergalactic space battle will set a new benchmark for cinema spectaculars.